What’s your most basic bucket list planning tool? I love these things. They help me remember little details and tasks, and they keep track of my notes on where, when, and at what cost bucket list items can be completed. They aren’t permanent, so if I decide I don’t need it anymore or if I’ve changed my mind about where I want to store them (usually I stick them on the journal page where I’ve written the bucket list item), then I can move them around or recycle them. Or I can take them with me on the trip when I go to do the item, so I remember where I’m going. 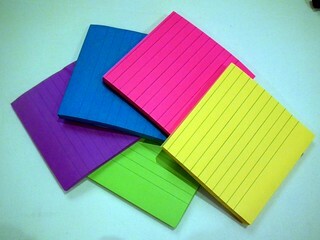 I cannot tell you how much I love sticky notes. I have different colours and shapes and sizes. They make me happy. This post makes me happy. It’s the simple things! 🙂 There are so many options! You’re right. Happiness is really in the simple things. Thanks for reading. Thanks for sharing that resource, Sonya! The Passion Planner looks like something that could be very useful. I totally get what you’re saying about your planner. For everyday planning I use a cheap generic day planner along with a mini monthly calendar so I can see things in a bigger picture view. On really overwhelming weeks I just use the blank side of a once-used piece of paper to write a massive to-do list (it won’t fit in my planner’s boxes for each day). It’s amazing how much I rely on these things to stay organized and remember things! I agree! I use a totally different notebook or the “notes” part of my iPhone for my overwhelming to-do lists, ha. 🙂 Yes! Part of their charm. Thanks for reading.